I am obsessed with Christmas scented candles, I start burning them in September because I get so excited for the scents. 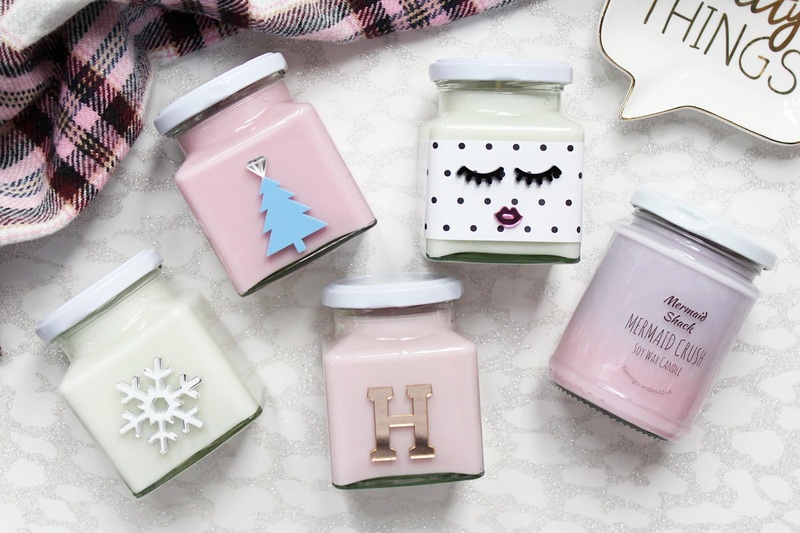 One of my favourite candle brands is Flamingo Candles and they have bought some some amazing ones in the last couple of months as well as their brand new festive ones. If you are looking for a new candle or a gift for someone, Flamingo Candles is the place to go! The first candle I fell in love with was the Peaches & Cream Dollface Candle. This is such a yummy scent with the notes of fresh peaches combined with cream and vanilla with added touches of raspberry and sugar. It is a great sweet scent but it isn't sickly, it mainly gives of the peach notes but I can definitely pick up on the sugar and vanilla too. It is a stronger fragrance so it can fill larger rooms with no problem. 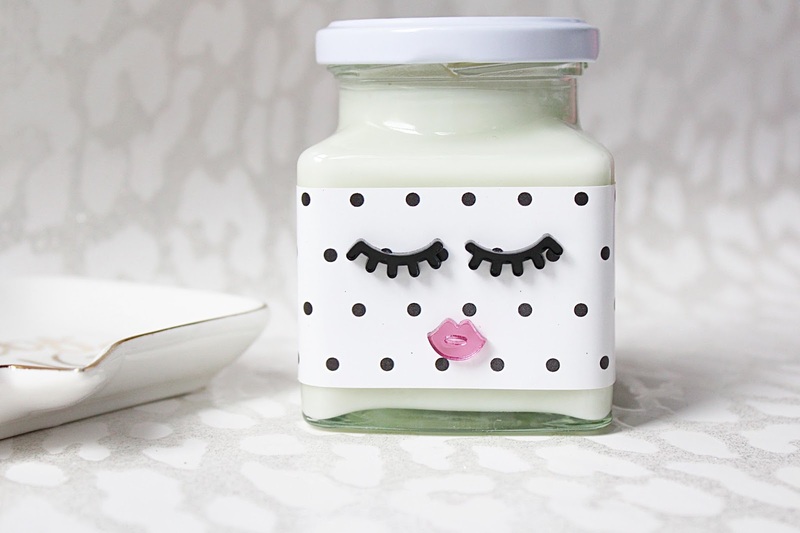 I really like the jar of this candle too with the little metallic lips and cute eyelashes, it's super girly and looks so cute sitting on top of my makeup storage! 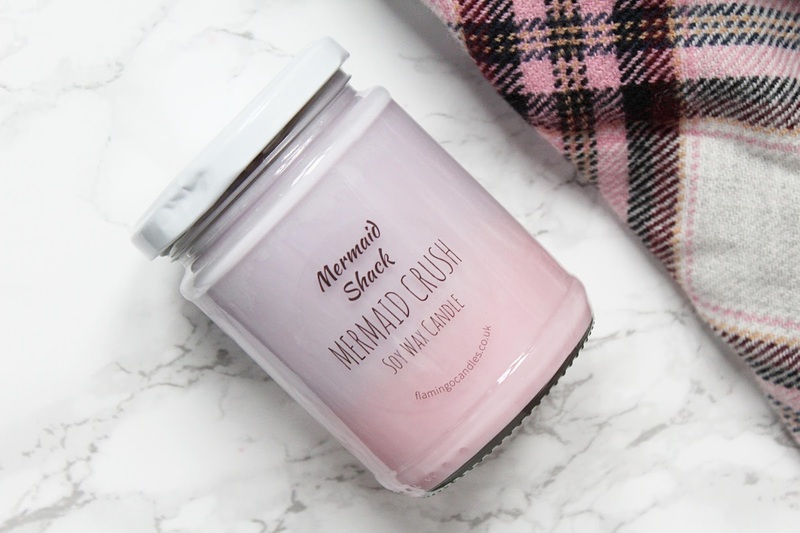 The other non-Christmas candle I have is the Mermaid Crush Purple/Pink Ombre Candle. This is such a stunning candle, the whole collection is really! This has been created the celebrate the mustery, allure and beauty of the enchanted sea mistress. This is a layered candle containing three fragrances and this is a juicy scent with notes of watermelon, peach and lime. This candle is such a lovely fruity scent with a slight freshness to it. The White Snowflake Candle from the 2017 Christmas Collection smells like heaven. This is the Ice Queen scent and let me tell you..this smells exactly like Snow Fairy from LUSH. My quest to find a candle of my favourite shower gel is complete! This has notes of bubblegum, pear drops and vanilla ice-cream and it's absolutely incredible! As soon as I smelt this I knew it was Snow Fairy and I officially need at least five more of this scent - I am addicted! The next candle I have from the Christmas collection is the Strawberry Prosecco Luxe Christmas Tree Candle. This has a rich and sweet blend of fruity strawberry juice with green top notes and a sweet malty, fizzy base. On a cold sniff, this smells like strawberry sweets but when you burn it you can really smell the fizzy notes of this scent. Even though this is a super fruity scent, it isn't at all sickly. My mum loves prosecco and she has become obsessed with this candle! 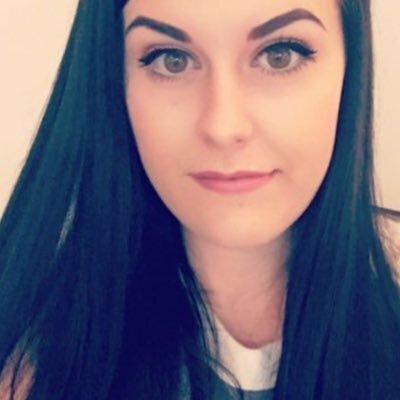 Last year I absolutely raved about the Bah! Humbug scent, it is one of my top three candle scents so I was so excited when Flamingo Candles sent me one over! If you love a peppermint scent with a hint of vanilla, you will fall in love with this scent. This is one of the few candles that actually fills the whole house with the fragrance, it is seriously impressive! If you are looking to gift someone a candle this Christmas, Flamingo Candles actually offer the Luxe Metallic Personalised Letter Candles which you are available to pick the scent and then have a name put on the lid as well as having a metallic letter put on the front of the candle! 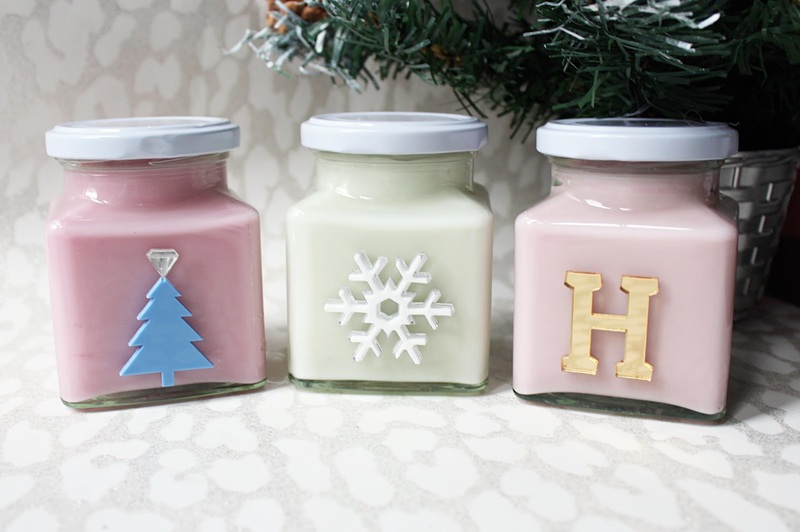 I think this is such a good gift idea, I love anything personalised and Flamingo Candles made me a Bah Humbug! candle with my name on the lid and a 'H' on the front all in my favourite colours! This is available from £12 which is such a great price point for the personalisation and how good the candles are. All of the Flamingo Candles are hand-poured in the UK using natural soy wax. With each of these candles you will get at least 40 hours of burn time and for around £12 each it is such a good deal! All of the candles have a great scent throw and one thing I really love about the brand is that all of the candles always have authentic scents, with some candles I have tried from other brands they can smell a little artificial but that is never the case with Flamingo Candles! You can find all of these candles at more - HERE.